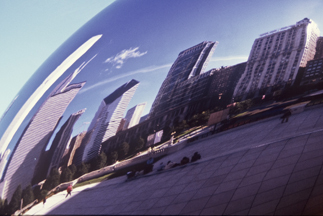 here’s a shot i love: the reflection of the chicago skyline along south michigan avenue as seen through annish kapoor’s marvelous “cloudgate,” affectionately referred to as “the bean.” the way the skyline is warped and bent through the seamless reflective sculpture gives the image an ethereal watercolor like quality. in a way it’s almost like a rea-life salvador dali painting. this photo was taken using kodak ektachrome professional plus 100 speed film. the other day i spotted an even scarier assessment of the current climate crisis our planet is facing. treehugger had an article in which they were citing a new calculation that claimed the arctic ice cap could be gone by as earlier as this summer. while earlier estimates ranged from 5 to 100 years, two of the more well known are 2013 and 2030. of course the process by which the polar ice caps disintegrate is exponentially sped up by increasingly lower and lower local and global albedo levels. that is to say, as the ice melts by means of a hotter climate due to global warming, less and less bright white, reflective ice remains on the globe to reflect large quantities of sunlight. in turn, more and more dark bodied water is exposed that absorbs more and more of the sun’s heat, thus speeding the process exponentially. when the polar ice caps disappear there will be little to nothing left to stem the tide of global warming: fears of dramatically rising sea levels inundating coastal cities, desertification of the subtropics, unpredictable and violent weather patterns (not to mention the exposure to increasingly vast amounts of ultraviolet rays and heat in general), and biological effects galore such as species collapse. of course not everything is doom and gloom; no arctic ice cap means the opening of the famed northwest passage including increased coastlines at the poles. the world’s food producing locations and robust economies will surely shift poleward as well. of course, the precious few benefits come at devastatingly alarming costs. regardless, let’s all hope we can get our acts together and stem the tide of global warming. additionally, this structure is to be environmentally friendly, though any skeptic would be quick to point out the sheer absurd abundance of materials, resources, and energy required to build and maintain such a structure. though it is true, such a design emphasizes efficiency in the way we live and minimizes our literal footprint on the earth’s surface as a function of living vertically as opposed to horizontally. personally, i don’t see any way either of these towers get the go-ahead anytime in the near future. regardless, i should hope at the least these proposal generate discourse about the way we live and how we should be living. are towers of this size necessary? despite being green, what are their environmental impacts? how do incredible dense footprints such as this affect the vibrancy of the neighborhoods surrounding them? surely though possible, the designers don’t actually intend the residence never leave the structure? while certainly fascinating ideas, i for one prefer not to see these built for fear of shattering delicate urban fabrics and destroying the delicate scalar balance of human existence. the sun sets on this precast concrete construction site. located in bolingbrook, illinois (west of chicago), this building, aptly named bolingbrook point 3, was a large industrial spec building with some incredible forms at the office/entry bays. the form of the building and the photo’s composition make this shot so wonderful. 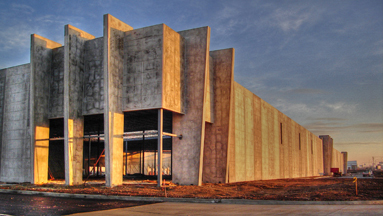 the rich colors of the sky and the sunlight-warmed unfinished concrete walls compliment each other quite nicely. the building seems to stretch on forever though and it makes me wonder about the appropriateness of such structures. while they are certainly indispensable in the transportation and storage of goods through and into cities, i wonder if we shouldn’t be thinking about overhauling the entire way we think about manufacture and distribution. a larger network of smaller, localized buildings and patchworks of infrastructure may more appropriately serve the way we live. as always you can find more photos here. 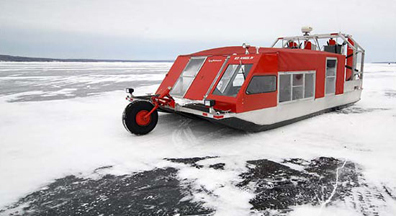 this part houseboat, part fan boat, looking contraption is actually an ice hovercraft school bus for a small rural community in wisconsin. the village in question happens to be an ice-locked island in lake superior. the 250 hearty souls who call la pointe, wisconsin home have to juggle the sometimes liquid water commute against the usually frozen crossing. their solution happens to be this ingenious hovercraft designed specifically for ice situations. maxing out at some 18 mph, the craft is hardly a powerhouse. what the vehicle lacks in power it makes up for in utility. what fascinates me though is the utter mobility of what amounts to a house (something i’ve been working with in my own thesis). 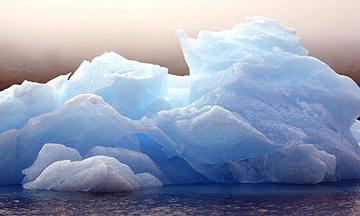 these icecrafts make me think about archigram’s plug-in city. i can’t help but wonder why these little red guys haven’t populated the surrounding waters as motor homes of the north, providing access and mobility to thousands who would otherwise be stuck inside. 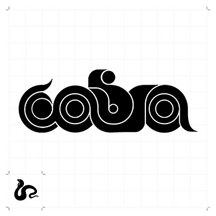 last week core77 pointed me towards a wonderfully ingenious typography set. jeremy pettis of the milwaukee institute of art and design designed this set as part of a thesis project. 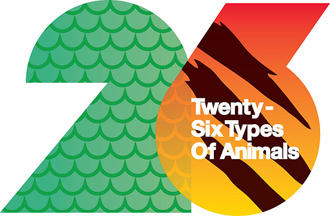 the set is organized by the first letter of each animal in alphabetical order. 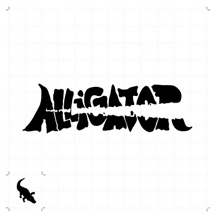 furthermore though, the font of each animal is appropriate to the form and characteristics of that animal, often times the written word resembles the animal’s shape itself. i find this to be creative, fun, and fascinating. this photo was posted to my friend kyle’s photoblog, oh yeah photos, back in early january. 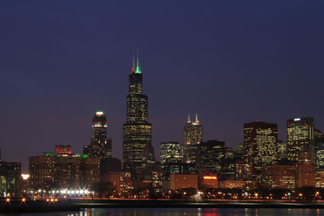 it’s, by far, one of the better (and certainly crisper) chicago skyline night shots i’ve seen. i love the purple tones in the sky juxtasposed to the already illuminated windows. the series of uber-bright street lights in the lower left adds a nice little visual punch to the composition. even if i hadn’t told you it was posted in january one could tell it was taken around the holiday season by virtue of the red and green lights at the top of the sears tower. 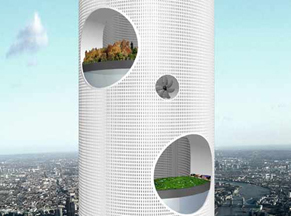 today archinect pointed me to a fascinating press release by hyder consulting in which they claim to be designing a 1600m tall building…that’s one mile high. of course immediately i’m reminded of the infamous frank lloyd wright design for the illinois, a mile high building itself (below). 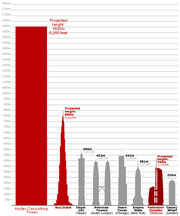 the current world’s tallest, though not yet completed is the burj dubai in dubai, uae slated to rise some 800m, or half as tall as this recent proposal (below). bldgblog whipped up the comparative picture at the top of the post; additionally though, a recent bldgblog post has even more significance with the announcement of a mile-high structure. tapei 101, the world’s tallest structure prior to the burj dubai, has actually caused the land around it to become tectonically unstable (it was previously 100% safe), ie. prone to earthquakes. the massive weight of the building itself is essentially causing earthquakes. i can only imagine what kind of forces a mile high structure would impose upon the earth. but the bigger issue here is not environmental effects or even architectural articulation of such structure, but the sociological implications they bring with them. 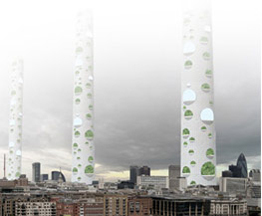 are supertall, supermassive, buildings ideal for living in? isn’t there a serious concern with scale, at a point these buildings are no longer in line with any human scale. furthermore, are these building even applicable to the way we live? in a world of global transience, impermanence, and instant everything we no longer live like we used to (see the thesis category). i can’t help but wonder if it’s even worth designing such a tower regardless of whether or not we can practically build it. 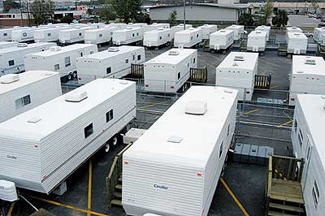 yesterday news broke that the fema trailers (pictured above) housing hurricane katrina victims tested positive for inordinate amounts of toxins, namely formaldehyde. specifically, five times the normal levels of formaldehyde were found in fema trailers. more than 100,000 people (some 38,000 families) still live in these temporary trailers almost 3 years after the hurricane, may of whom had been reporting serious illnesses and respitory problems almost immediately after being relocated to the trailers. first, it’s simply unacceptable that 100,000 people are still living in temporary trailers almost three years later. second, i am astounded to find that, at minimum, these people havent been relocated to any number of the proposed alternative dwellings all of which have been extremely cheap and necessarily small but humane and warm with wonderful architectural articulation. 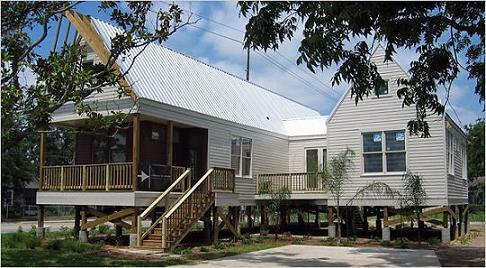 some of these include the lovely katrina cottage (pictured above and discussed here). 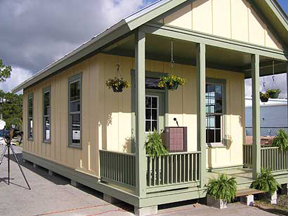 another wonderful example is the architecture for humanity response in biloxi, mississippi (pictured below and discussed here and here). these people deserve better; i would think that at minimum they should not have to go to sleep at night hoping they aren’t being poisoned. it is unconscionable for fema, the federal government, the state government, or insurance companies to allow this to happen. furthermore, it is shameful that those who had to endure the devastating and traumatic experience of the hurricane have been forced to live like this, to live through this, for the past three years. 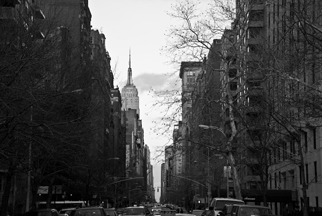 this photo was lifted from devyn’s nyc photoblog, 24gotham. 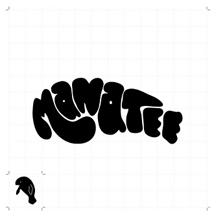 as one of our favorite blogs we’ve mentioned it before, but it always proves interesting. this is a powerful shot to be sure. according to the metadata it was taken with a nikon d80, which just makes me jealous. the overwhelming perspective combined with the dynamic black and white tones really make this picture pop (not to mention a certain special building in the background anchoring the whole composition). if you’ve never seen 24gotham be sure to check it out (you could also venture to his old chicago-based photoblog, aptly named looper, if you’re feeling adventurous). our goal here at the way we live is to explore the way we live, physically, in terms of architecture and urban planning, socially, including how we interact and how we address culture, and practically, regarding products and materials we develop and use to make our lives more sustainable, more organized, more efficient, and more enjoyable.